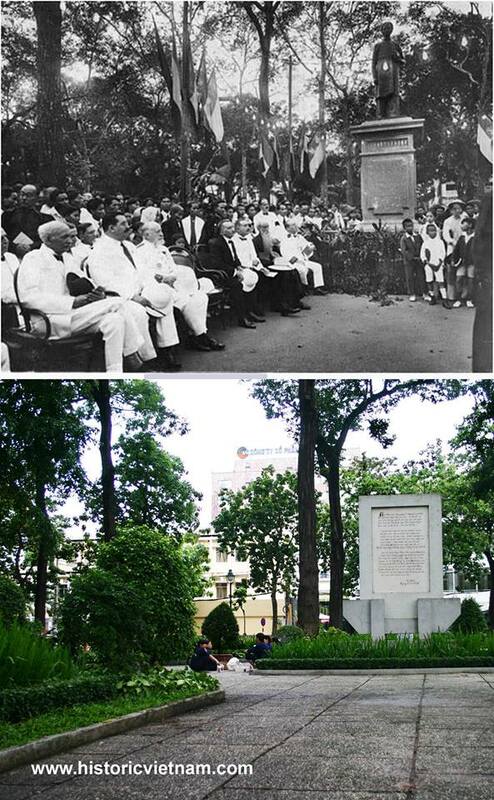 The inauguration of the Pétrus Ký statue (now in the HCMC Fine Arts Museum) by “master sculptor Constant Roux” in the gardens behind the Cathedral on 19 December 1927 (photographer unknown). 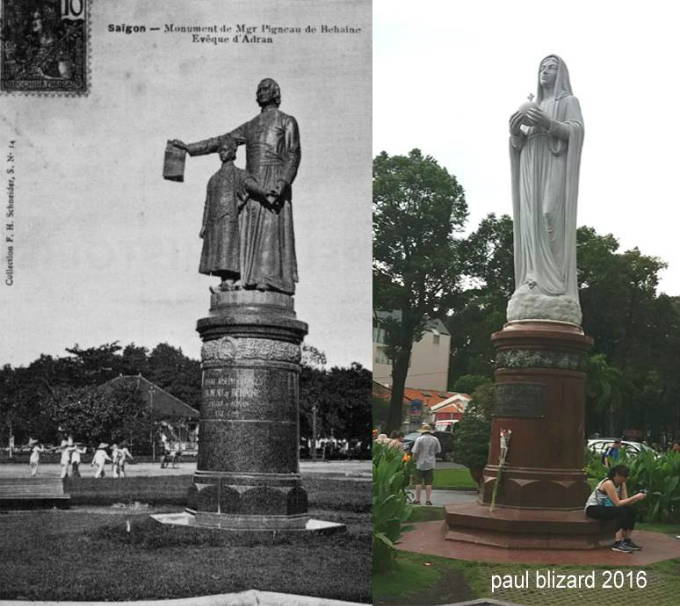 And on the same spot today, the 1978 memorial to a French sniper attack on a crowd which had gathered behind the Cathedral to listen to a broadcast of the Declaration of Independence on 2 September 1945. 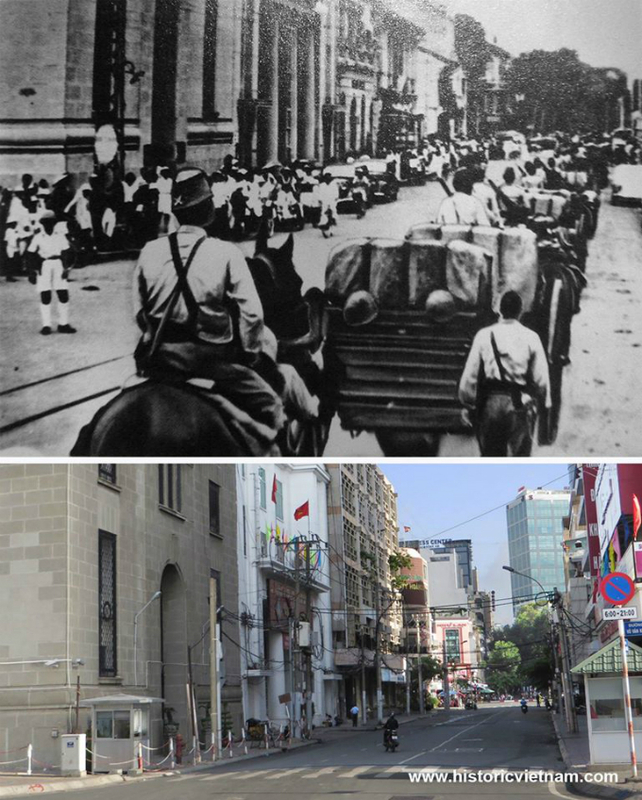 Japanese troops entering Saigon in July 1941 along rue d'Adran and the same view along Ho Tung Mau (D1) today. 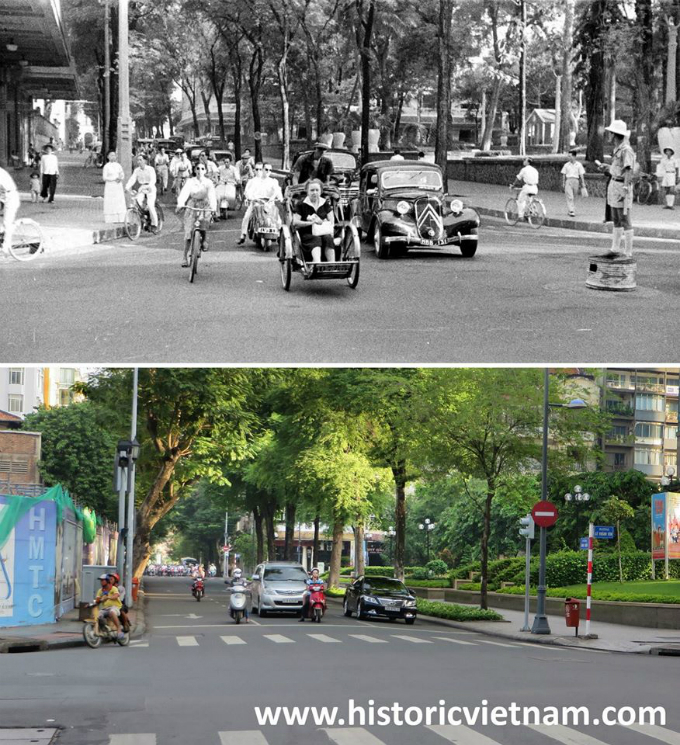 The junction of rue Catinat/Dong Khoi with rue d’Espagne/Le Thanh Ton in 1950 (photographer unknown) and today. 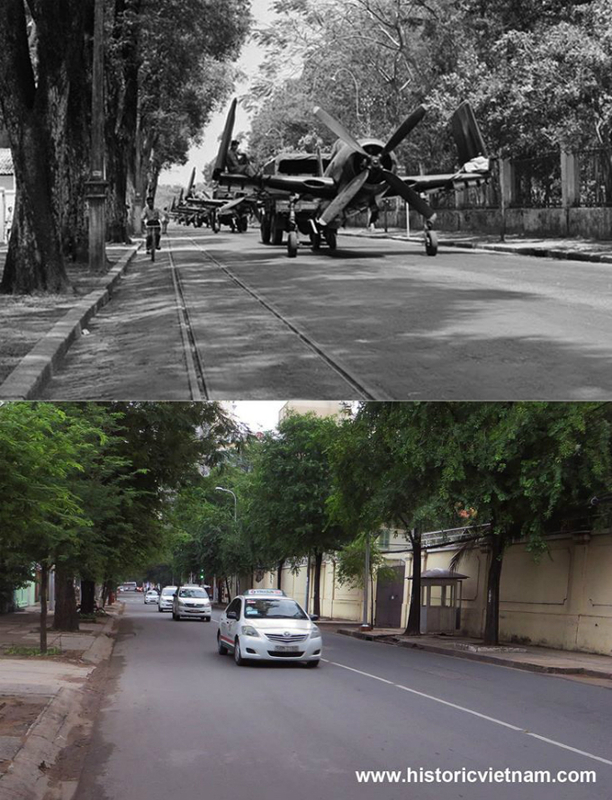 Grumman F8F "Bearcats" suppled by the United States to the French Air Force being towed along rue Paul Blanchy (between Norodom boulevard and rue Chasseloup-Laubat) en route from the port to Tân Sơn Nhứt Airbase in Saigon, 1951 (LIFE Magazine). 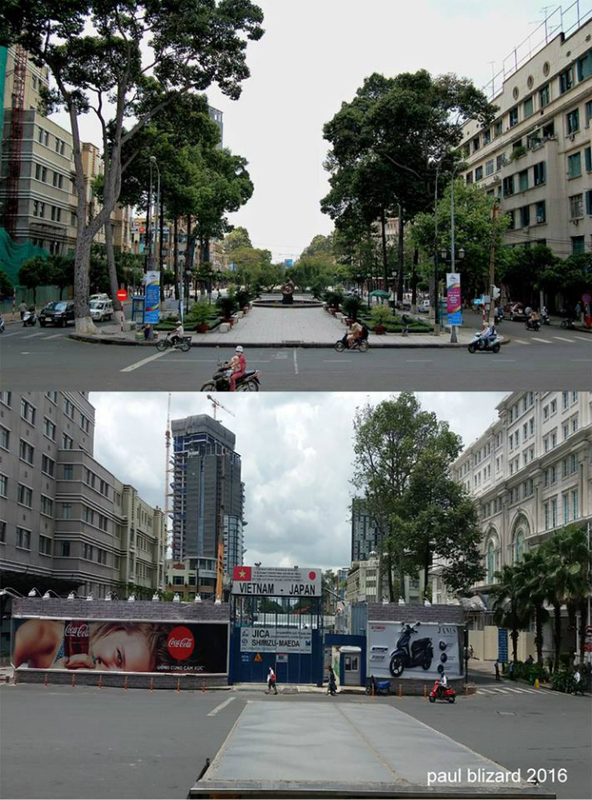 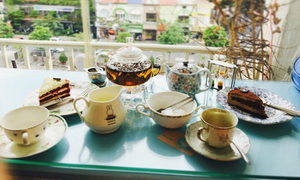 And the same section of Hai Bà Trưng street (between Lê Duẩn and Nguyễn Thị Minh Khai streets) today. 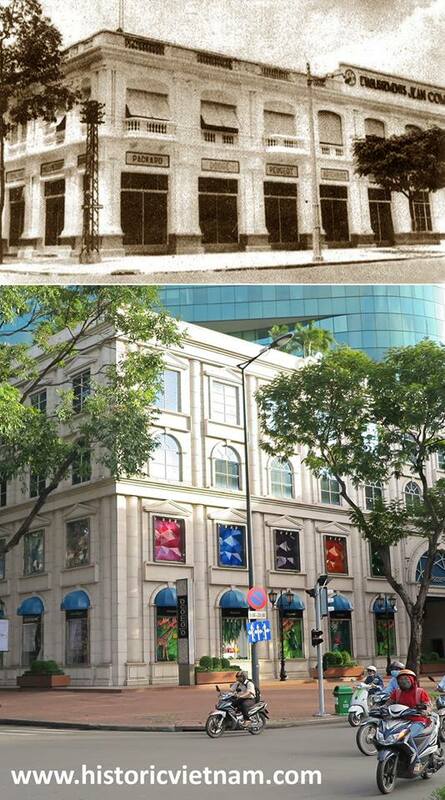 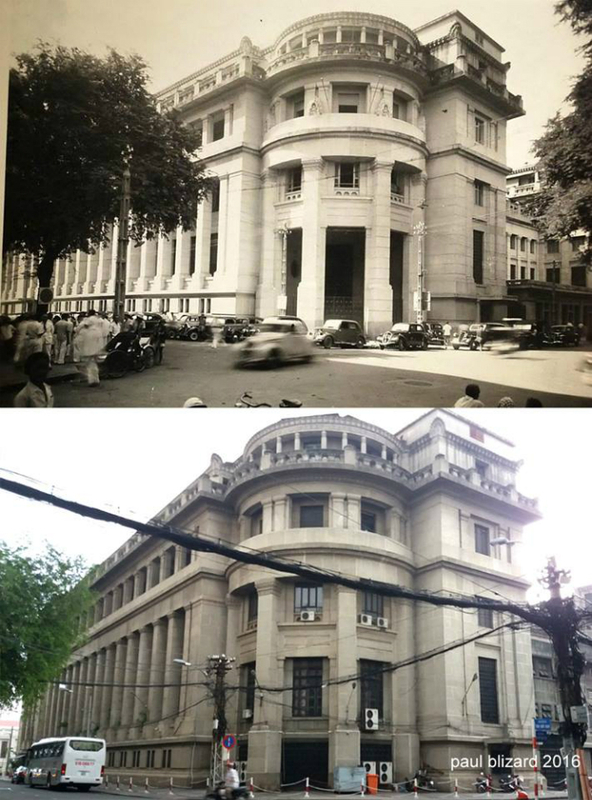 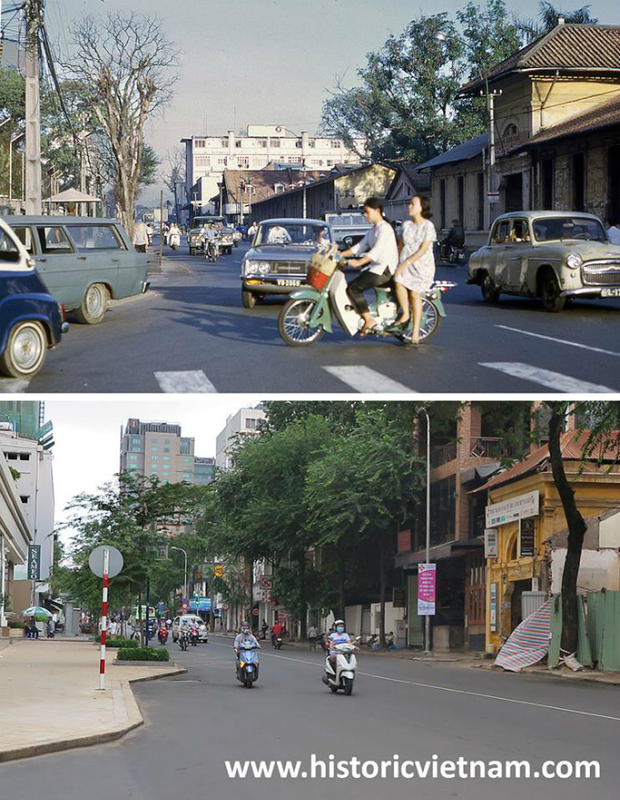 213 Tu Do in 1965 (photographer unknown) and the same view of Đong Khoi street today. 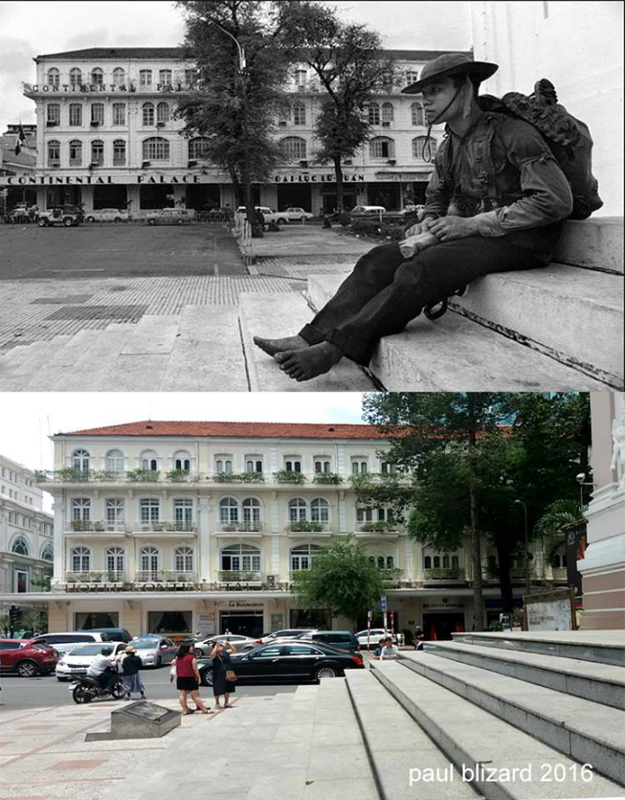 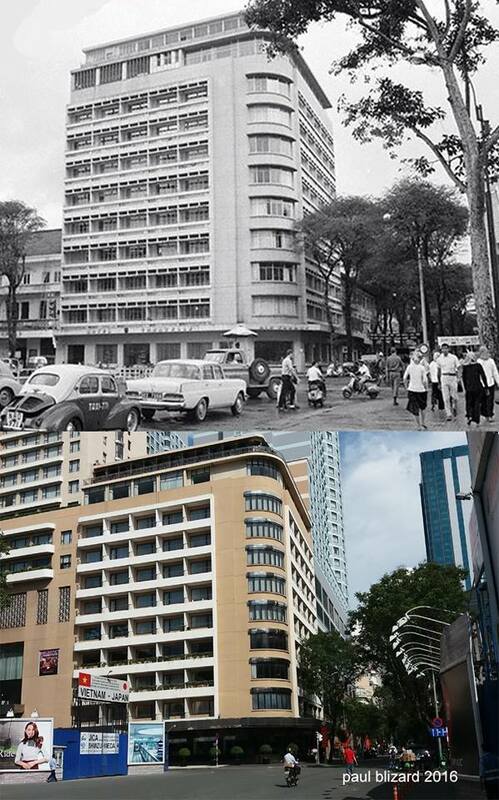 A Robert W Kelley Life magazine image of Me Linh square during the February 1965 coup, and the same view today. 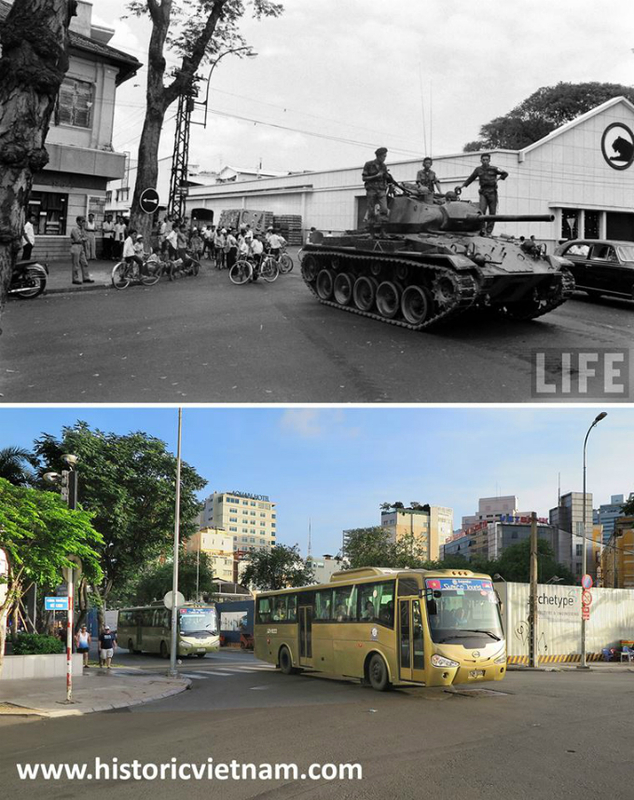 In the background of the "Then" image is the recently demolished BGI warehouse. 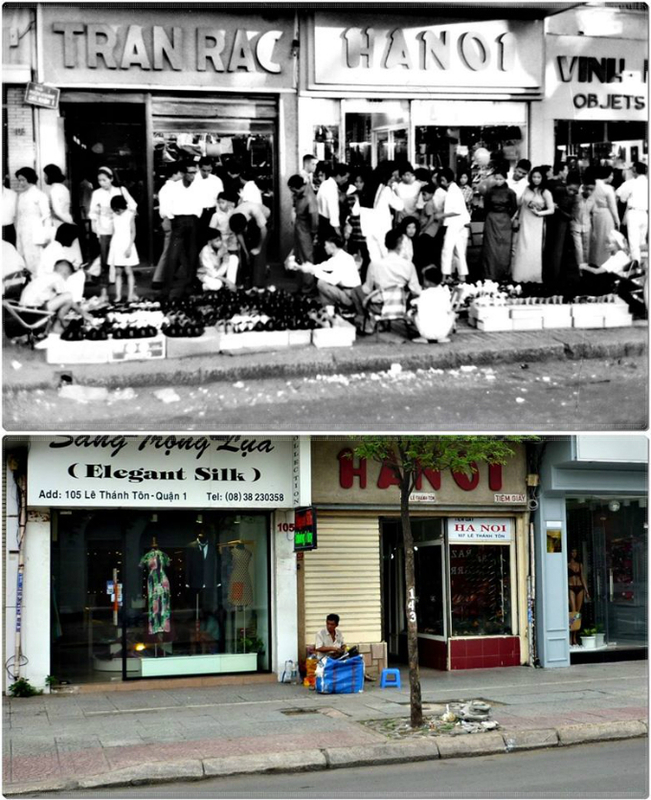 Shophouses on Le Thanh Ton street between Pasteur and Cong Ly (now Nam Ky Khoi Nghia) streets in 1966 by Mikey Walters' father, and today. 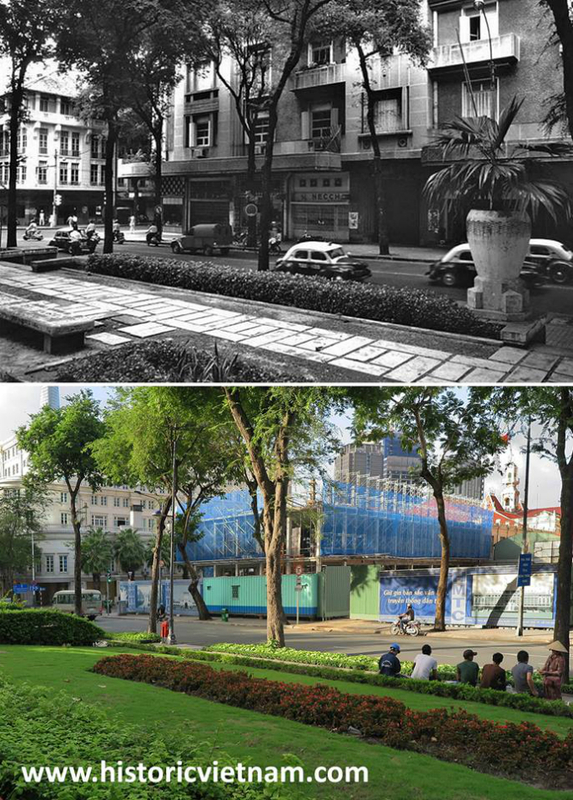 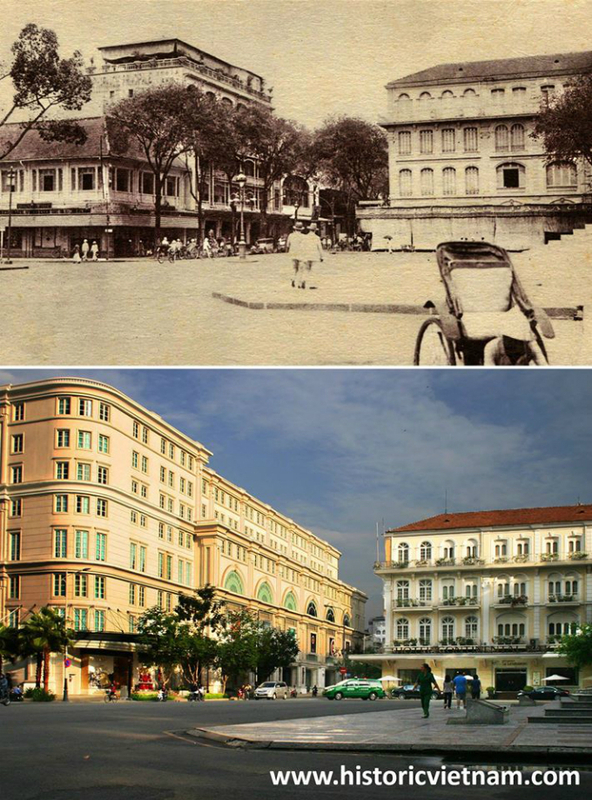 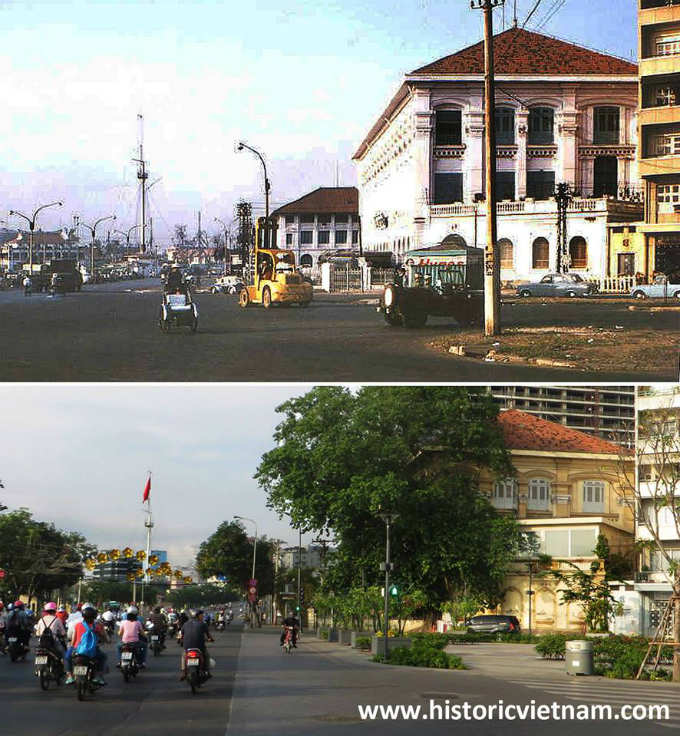 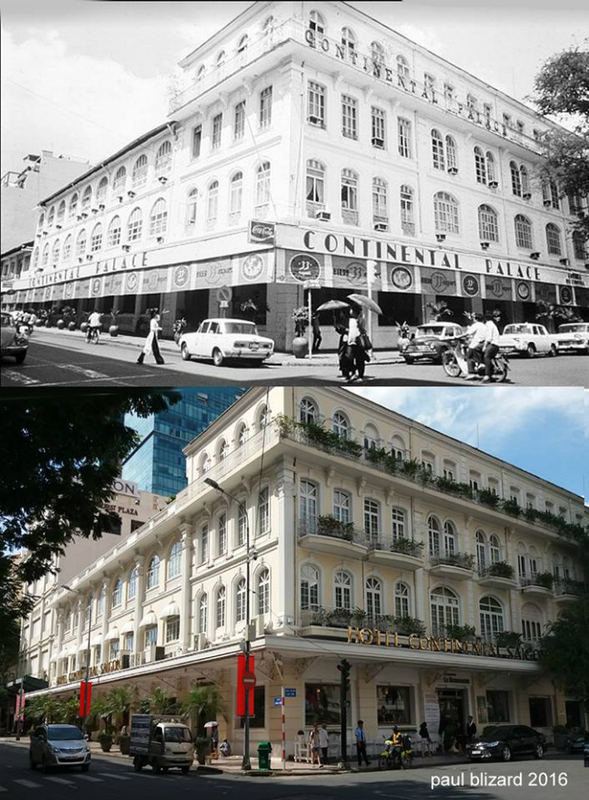 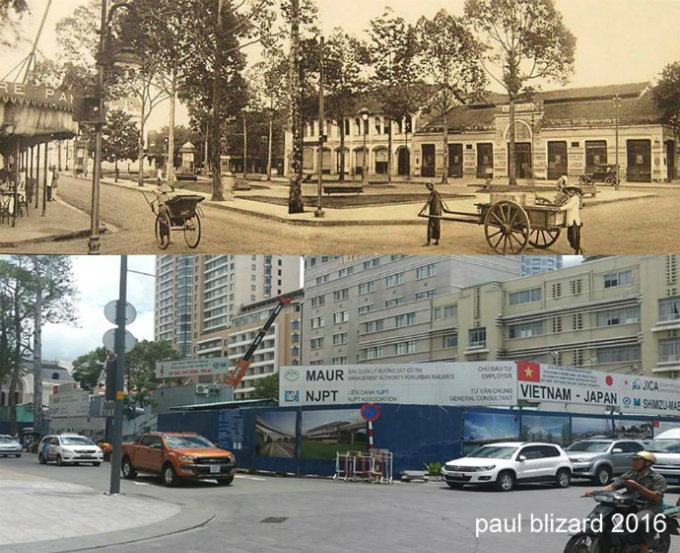 Hai Ba Trung street between Lam Sơn square and Lê Thanh Ton in 1969 (photographer unknown) and the same location in 2015, with the gate of the former Manufacture de l'Opium visible in both pictures. 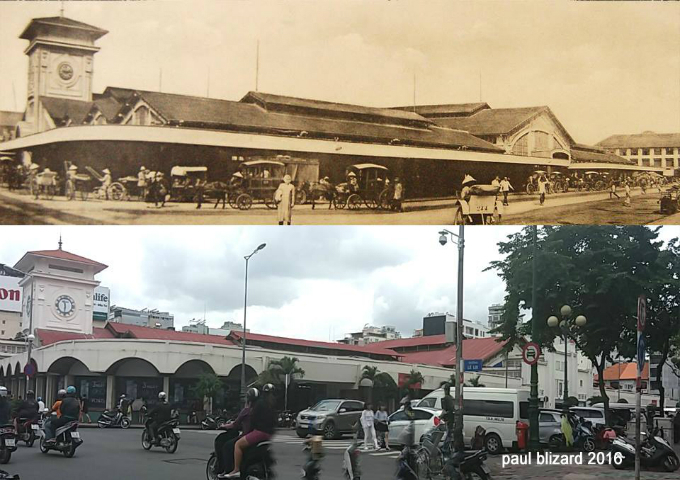 A 1960s shot (photographer unknown) of Bạch Đằng wharf showing the Customs Directorate and behind it the Port Directorate. 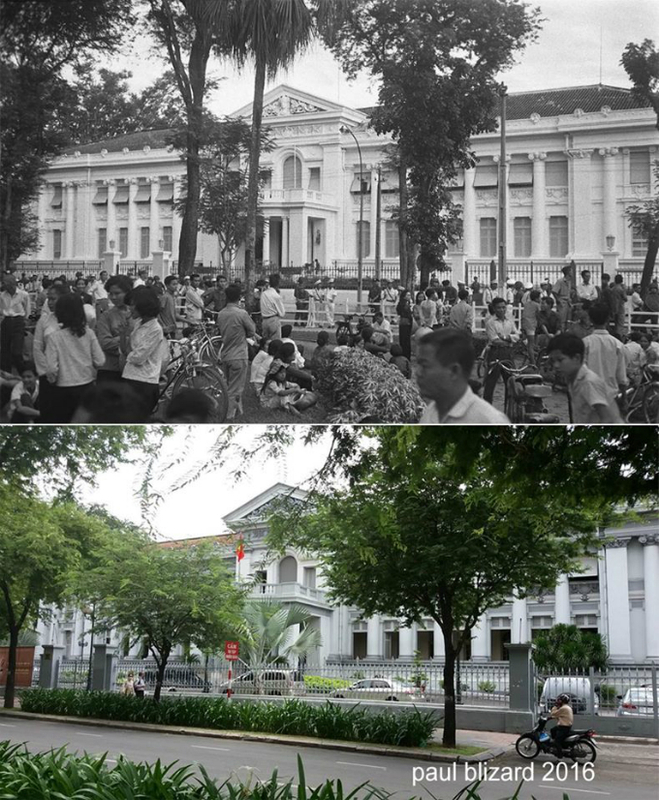 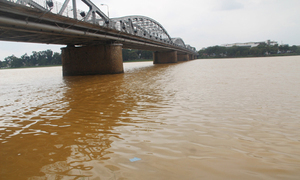 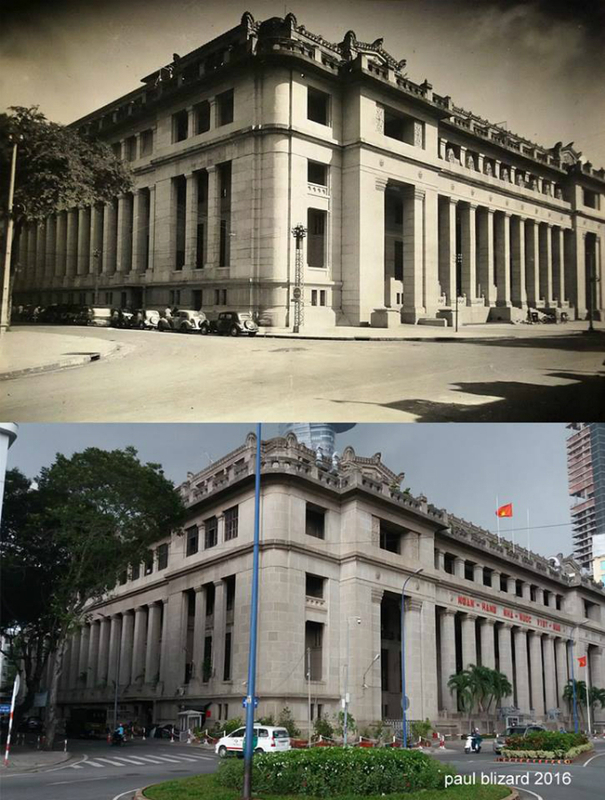 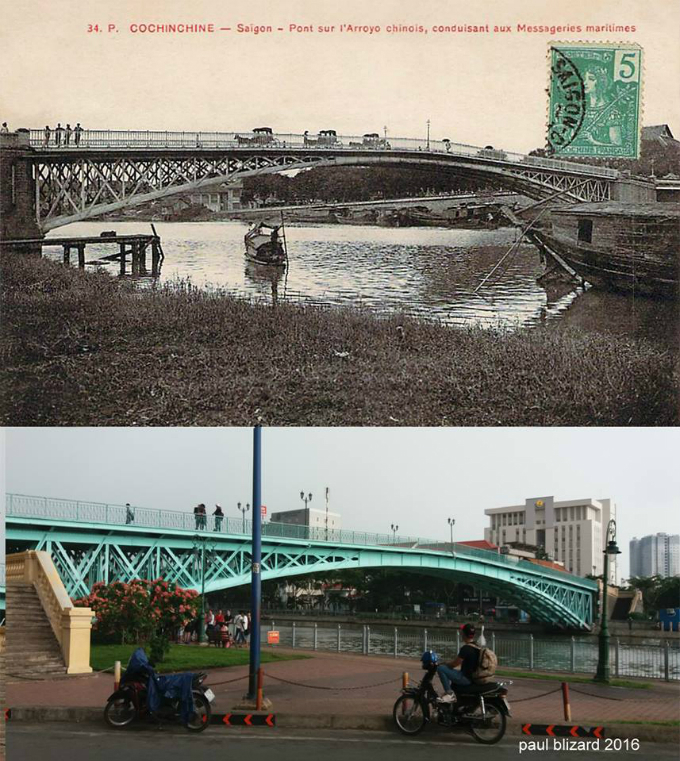 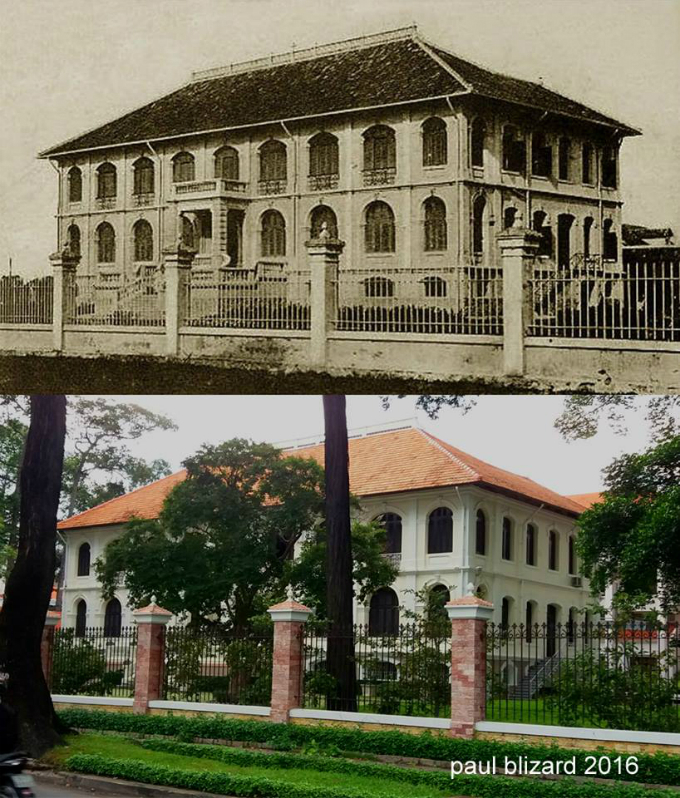 And the same view today, the Port Directorate having been destroyed to make way for the abandoned rusting hulk which is Tòa cao ốc 34 Tôn Đức Thắng. 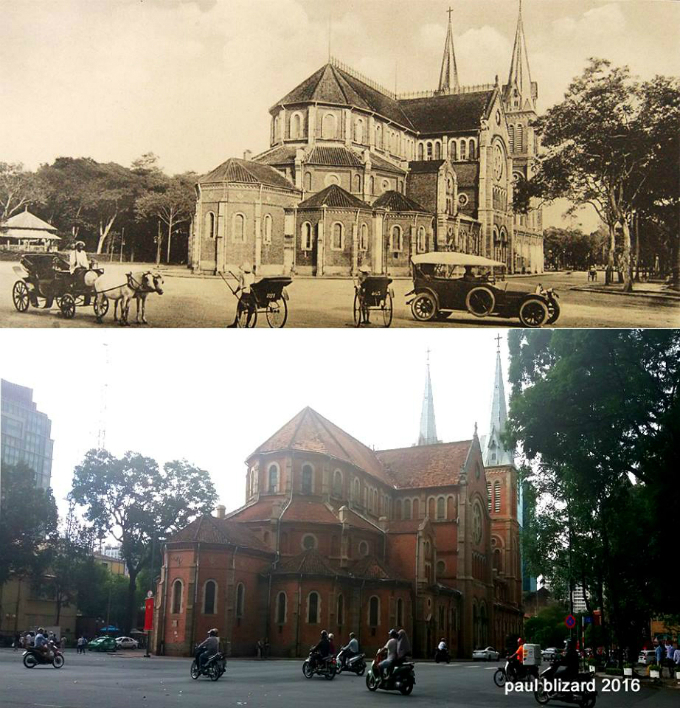 Republished with permission by Tim Doling, the author of the walking tours guidebook Exploring Ho Chi Minh City (The Gioi Publishing House, Hanoi, 2014). 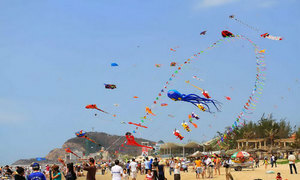 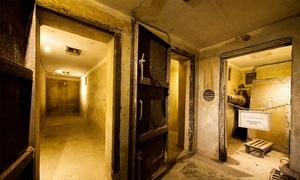 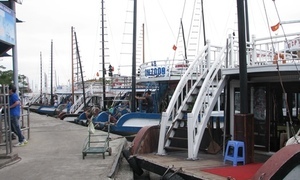 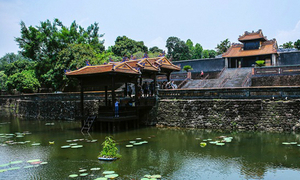 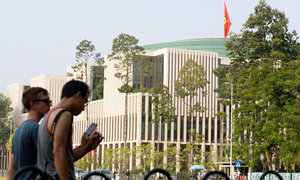 For more articles about Vietnam’s history, visit his website, Historic Vietnam.